This would totally be the list of systems for which I have written reviews. Systems are those things you plug media into, as well as controllers, cartridges, adaptors, and generally speaking what is no doubt a shitload of your life's earnings. 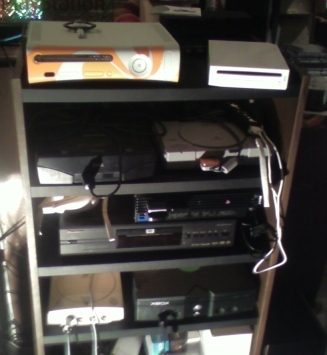 Speaking of wasting one's cash, that image you see is of my personal console setup - a 360, a Wii, a PS2 and an XBox all plugged into a component switchbox, a Saturn, Dreamcast, DVD player and a PlayStation 1 connected via a SVideo switchbox, and a shelf full of misc. crap including non-connected N64 and MegaDrive consoles. It used to be my family's stereo cabinet bought way back in 1973, the year I was born, but it's held up well over the years, coming halfway around the world to end up holding my shrine to entertainment technology. Let's just not mention how I managed to smash the glass doors at the bottom, eh kids?